This is where I describe my quilting, knitting and crafting journey -- both the successes and the failures. There are so many interesting things to do and try! I hope you enjoy sharing my journey with me! I hope everyone is enjoying spring! I've been enjoying the weather! I did get sick with a stomach flu that wasn't a lot of fun. It cut into my productivity, but I'm all better now and am starting to make progress again. 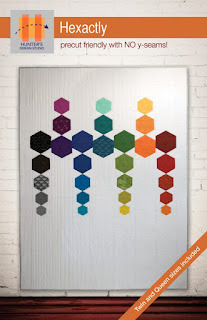 The pattern is Hexactly by Hunter's Design Studio. I liked the crisp, modern feel of this pattern and thought it would be perfect with the hexagons done in the LGBTQ rainbow colors. So, I pulled out the pattern and started planning. The picture on the front of the pattern is for the twin-sized version of the quilt. The queen-sized version of the quilt looks the same, but has 11 columns of hexagons. I really want just the rainbow colors, so I'll be changing it up a bit. So, I'll be doing 7 columns like the twin-sized quilt (the LGBTQ rainbow actually has 6 colors, but I'm taking some license here because odd numbers look better and I like having some of the columns go up and other columns going down). I'm going to piece each column and set them on top of the background before making any other final decisions, but my initial feeling is that, unlike the picture, I will separate the columns with some background to make the motif wider so it isn't lost in the middle of the bigger quilt. Then I will probably line up the largest hexagons evenly across the quilt, instead of staggering them up and down like the picture, with the other hexagons going up and down as in the picture. Then, with the quilting I'll add ghost hexagons in the column colors so that all of the columns end up having the same number and sizes of hexagons and they just alternate which are pieced and which are quilted. The rest of the quilting will probably some form of vertical straight-line quilting. I'm currently calling this quilt "Inclusivity," although the name could change before I'm finished. I have several months before I have to make that decision! I did have to order a large quantity of a solid fabric for the background of the quilt so I went to thousandsofbolts.com, my favorite online fabric shop that carries every color of the Moda Bella Solids fabric that I love. I have a color card at home with a bunch of fabric samples of this fabric, so I got that out and looked at the grays. I was initially thinking I would use a light to medium gray for the background. But when I was looking at the fabric samples, my eye kept being drawn back to this charcoal sample. It's a beautiful dark gray with a brown undertone. It still is very modern, but is less mainstream than the lighter grey I was thinking about. The other colors I've chosen are bright, standard rainbow colors. This picture doesn't capture the brown undertones of the solid, but you get the idea. I also decided that I would use a single fabric for each rainbow color since I don't think that making that part scrappy would add anything to the quilt. That was a hard decision for me since I'm so attracted to scrap quilts! So, now it was time to start the piecing. There's not a lot of piecing in this quilt, but the hexagon angles make the cutting an sewing take more time. To cut the hexagons, I made a copy of the hexagon shapes in the pattern, cut them out and taped them to the back of my rotary ruler. Then, I lined that shape up to the edges of the fabric and cut each edge. I didn't stack my fabrics when cutting the hexagons because I wanted the cutting to be as accurate as possible. I feel like I'm making pretty good progress so far! And I'm loving the colors!! Then I decided that I should also finish my Moxie Cowl. All of the knitting had been finished on this project for a couple of weeks and I had even soaked it and pinned it to the blocking boards, so all I needed to do was stitch the sides together into a circle. So I pulled that off of the blocking boards and stitched it up with a Kitchener stitch. I haven't done much Kitchener stitch so I had done the stitches much too tightly, but it was easy to go back and adjust the yarn to get a perfect tension on the stitches after the fact. I really love how this cowl turned out!! The stitch pattern in the middle of this scarf is really easy to memorize and is really fun to do! I'm almost done with the center section and I'm going to miss working on it, but really look forward to wearing it! Well, that's all for this time. Hopefully I'll make some good progress on my niece's quilt before next time. I'm really looking forward to getting the columns of hexagons done so I can start playing around with layouts! We're supposed to have highs in the 50s next week so I look forward to seeing more of the ground and to our neighborhood roads widening a bit so cars can pass by each other a little easier, but I don't look forward to how muddy the roads will be! Oh well, it's good to have moisture anyway! I really like how these turned out and when I run my finger across the yarn everything feels secure. I just made these yesterday so I still need to make a project bag out of them, but I should have that finished by next time. I do think I want to play around with this couching some more! This has been a lot of fun! In the pattern, the back doesn't have any applique or embroidery on it. I've decided that I want to add some since you sometimes end up looking at the back side of the bag and because it seems a shame to waste this space when I could have some more fun here. So I ordered some wool felt so I can add something to the back. I'm thinking I'll put some flowers and leaves or some butterflies back there. I'll let you know what I decide! I've been picking these up because I want to make a Cherrywood string quilt at some point. But I also had started picturing a Cherrywood string-pieced project bag and decided that I had to start on one. I used a fusible fleece for the base and used sew-and-flip to add the strings. Then I added a 1-inch band across the bottom of the strips and then added the bag bottom, also using sew-and-flip. Then, my idea was to do a variety of hand embroidery stitches in the strings, using some Valdani perle cottons that I picked up a while ago that have the same earthy colors as the Cherrywood fabrics. Just as I was about to start the embroidery, I realized that I didn't want the embroidery to run all the way up to the zipper, so I added another 1-inch strip of fabric across the top of the panels. I did this after I had trimmed the panels so this was originally just a fabric layer. When I started the embroidery, the top strip kept flapping down and it started to fray, so I quickly added some interfacing to the back of the strip, added top stitching to the folds on the bands and also added a narrow zig-zag stitch to the top edge of the fabric. Everything is feeling a lot more secure now and I'm not seeing any more fraying. I'm really loving how these are looking so far! And I'm enjoying the embroidery. I wasn't sure how the Cherrywood fabric with the fusible fleece would needle, but it really sews easily. Which is good since there's a lot more stitching to do on this bag! I was hoping to get it blocked and get the ends sewn together before this blog post, but I'm really good at procrastinating when it comes to blocking my knitting. But I did get it in the bath today and it's upstairs blocking now, so hopefully it'll be completely finished by my next blog post! This sweater has an interesting construction. You start on the bottom of the right arm and knit the right side of the sweater. Then you start at the bottom of the left arm and knit the left side of the sweater. For these sides, the knitting stitches sit sideways from what you normally see. Then you knit the back panel, attaching it to the sides as you knit. Then it's the side panels that finish the sides and sleeves as you knit. Finally, there's an I-cord edging that ends in some I-cord that creates a tie to close the sweater. So there's no seaming at the end. I just have the back and side panels and the I-cord to finish this up. I hope to get that done in the next week. Finally, while I was taking a hiatus from the Baby Novus sweater, the March Lola's Choice kit arrived. Isn't that pretty? I just love the colors and can't wait to get back to this project! Well, that's about it for now. I hope to have some finishes and maybe a few new fun projects for next time. It's been another fun couple of weeks. I'm excited to have finished my Tree of Life wallhanging, which was the class project from my Jane Sassaman class at Houston last year. I really like how it turned out! Since my previous post, I applied the binding and did the main panel background quilting. I applied the binding first because I like to get that out of the way and because it's easier to quilt the inside with the clean edge on the outside. I'm really happy with how this binding turned out and I'd rate it as one of my best bindings ever. The corners, where I have my biggest problems, turned out almost perfect! It was a bit difficult to get good lines in this area because the thread matched the background too well so it was difficult to see where I had already quilted, but I like how it turned out. As I got to the bottom, where the blue dots were so dense that they disappeared into each other, I switched to blue thread and just quilted pebbles. Now I just have to sew on the hanging sleeve, which is pinned to the quilt and ready for the hand stitching. Some people sew the top edge of the hanging sleeve inside of the binding, but I'm really picky about my binding and you don't get as clean of a binding when you do that so I put in the extra effort to stitch the entire hanging sleeve by hand. I went ahead and made it the size in the pattern, even though I was a bit worried that it would be too small to hold a knitting project. It did turn out a bit small, but might still be useful for a small project like socks or mittens. But I'll find uses for it. I also did some work on my second Sue Spargo project bag, the Birds on Parade Sac. I got the applique done and started on the embroidery. I'm really enjoying doing the embroidery on the wool! The back side of this bag doesn't have any applique or embroidery on it, but I might add some after I finish the front. It depends on how anxious I am to get the bag finished and put a project in it! I found some really cute buttons in my stash to use and I really love how these turned out! These will be going into my Homeless Shelter bag, but I might have to also make a pair for myself. Isn't that cool? I'm about halfway done with this project. I would have finished it, but realized I needed to get back to the mittens (above) and the baby sweater (no progress this time) if I'm going to get them finished by the end of the month for Laura's knit-along. I just have to connect the ends and this project will be finished. Then I just have to decide: do I keep this for myself since I love it so much, or do I give it to my niece who loves to wear blue because it goes so well with her blonde hair? I hope everyone is staying warm through these last few dregs of winter and a looking forward to a beautiful spring!